Skeena Heliskiing was founded in 2004 and has access to one of the largest heli skiing areas in the world with an area of 9,525 km2. The Skeena Mountain range has a huge diversity of terrain, from the high vertical slopes with steeps to powder bowls with pillows and shoots. Heli skiing doesn’t stop during bad weather with plenty of tree skiing and an abundance of sweeping glades. Skeena’s geographical location and diversity of terrain allows us to consistently enjoy one of the lowest number of down days in the industry. Our nearest airport (Smithers) is located only 1.5 hours from Vancouver and 2.5 hours from Calgary. Flights are available daily from Vancouver International Airport directly to Smithers. Calgary flights are daily via Prince George. Our van shuttle will take you on the 1½ hr drive from Smithers to the Bear Claw Lodge. The Bear Claw Lodge offers our clients very exclusive, personal and high quality accommodation, and is only 6 minutes by helicopter to your first runs. We cater to a maximum of 12 guests per week, either looked after as 3 groups of 4 or 2 groups of 4 and a private group. We use B2 helicopters as they allow us to access the best of our terrain and better cater to our smaller groups. Our highly experienced guides are UIAGM or ACMG/CSGA certified and and our helicopter pilots have many hours mountain flying experience.Our staff are there to ensure your safety whilst leading your group or flying you from run to run. We look forward to welcoming you (back!) to Skeena for some great skiing. Skeena Heliskiing is a member of HeliCat Canada. 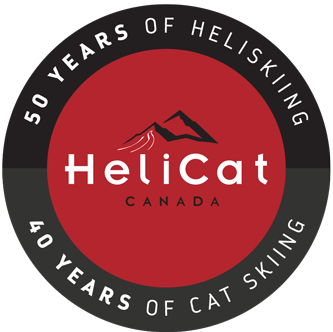 HeliCat Canada is the trade association of the Canadian helicopter and snowcat skiing industry. Their primary mandate is to promote the continual improvement of the industry through research, education, advocacy and overseeing operational guidelines.